Freeing ports should be kept open and made sure that there is an easy flow of water to and through them. 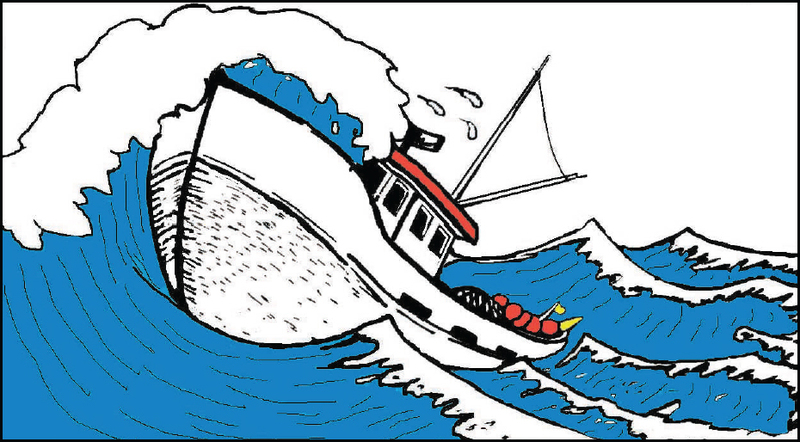 Water trapped on deck can cause a danger because of free surface effects and a rise on the vessel’s centre of gravity. Make sure that the fishing gear does not absorb water or stow icing on the deck or prevent a flow of water through the freeing ports. When the main deck is arranged for carrying deck loads with dividing pound boards, there should be slots of suitable size between the boards to allow an easy flow of water to the freeing ports. The number of slack tanks should be kept to a minimum. Have a look at all instructions about the use of ballast tanks. Partially-filled tanks reduce the vessel’s stability and can be dangerous. It is unauthorized have unprotected and uncovered fish boxes on the deck. If water becomes trapped in the boxes it will reduce the vessel‘s stability and increase the risk of capsizing.